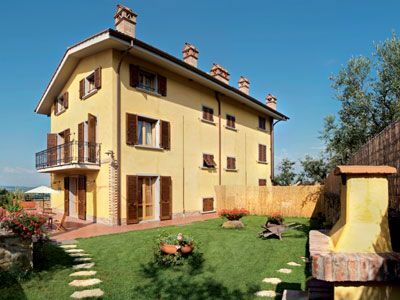 Antico Borghetto di Tigliano is a villa located in the heart of the hills in Vinci, the birthplace of Leonardo da Vinci, and can host up to 10 people. The villa is the perfect place for a relaxing holiday immersed in the nature but not far from the main tuscan cities such as Florence and Pisa. Antico Borghetto di Tigliano is situated among the beautiful hills of Vinci, only 2,5 km away from the house where Leonard0 was born. Here the genius would stop over to relax and gathered inspiration for his great discoveries. In Vinci there are all kind of shops and services. Nearby there also many restaurants, a manège (3 km), a supermarket (3.5 km), a golf club (5 km), a wellness centre and it's possible to do trekking. Vinci, 2 km from the villa.